An edited version of this post can be found on STEEMIT: Upvote me to support my travels for free! Why vigorous? Because A) I was traveling in low season, on B) an alternative road with C) no trucks nor public transport*. Because it’s all dirt road, all transport makes a detour via the coast… but I was determined to finish the entire trip via the fabulous Ruta 40. In reality that meant about 2 or 3 cars A DAY passing by and I had to track them down and convince them to help me out. Add up that in Patagonia every tiny village is about 200-300km apart from each other and in between is literally nothing. No people, no houses, no cars… just a fierce, devastating wind making almost every life form impossible. And I was hitch-hiking there alone. Steph, you need to see a doctor… those specialized in mental illnesses, that is. 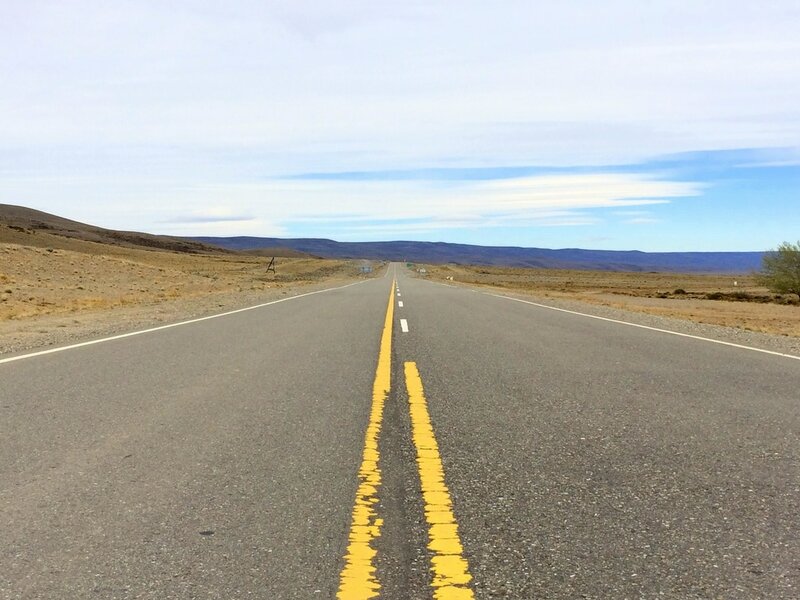 ​The family that without knowing me had picked me up from the street to host and feed me for two days drove me to the edge of Los Antiguos, where the police helped me to fetch a ride back to the city Perito Moreno. The chatty tattooed man that almost immediately picked me up dropped me off on the ice cold crossing of Ruta 40 where supposedly all traffic down south passes by. After about 40 minutes the first car came into sight: A father and son driving to some religious celebration in Las Posadas. We drove passed the Cueva de los Manos (a cave with pre-historic hand prints) and the dazzling pink, orange and purple colored mountains around Rio Colorado, saturated with sought-after minerals, where they subsequently let me out at Baja Caracoles… a village with a total of 30 inhabitants and 2 dogs. And then… nothing… I stood guard at the road side, walked and jumped up and down to fight against the cold, peed behind a traffic sign, sang out loud all the songs I could remember the lyrics of… and nothing. No cars. No people. Two hours passed. Still nothing. If I would allow that to take away my freedom to explore, wouldn’t that make me dead already? When we entered in Gobernador Grenadores after three hours, a friendly face looked over his shoulder… They would drive me to Tres Lagos, a 180km detour all over dirt road, so I would be a bit closer to my destination. 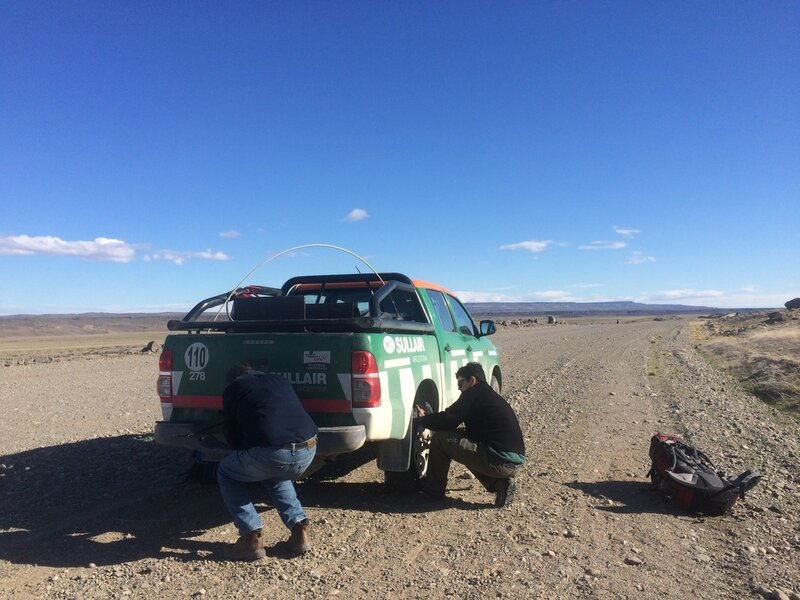 The terrible condition of the road caused a flat tire, which they swiftly changed in the unforgivable wind (while I, very helpfully, made pictures of them doing that). Tres Lagos appeared to be about 20 meters long, without Wi-Fi, phone reception or even a pay phone. There was one campsite and I didn’t have a tent with me, too cold in Patagonia. “You know what, we’ll drive you to the crossing then!”… which was even MORE in the middle of nowhere with no option of accommodation anywhere near. It was getting dark. 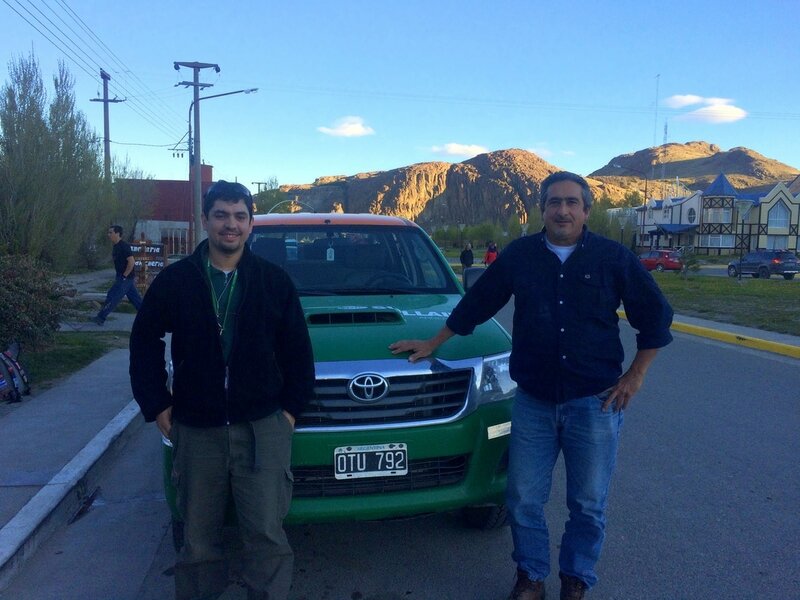 “Oh screw it, we’ll bring you to El Chaltén altogether”, these men, my heroes of the day, shouted. Yes, you read it correctly. These gentlemen, these saviors, drove 456 kilometers, 7 hours AND BACK AGAIN to a place where they didn’t need to go, just to help a stranger out. Risking losing their job as well, as they were driving in working time tracked by a GPS-system. I sincerely can’t get my head around how unimaginably noble and generous people can be. It’s a refreshing reality-check contradicting what people think of others and the world they live in. I couldn’t believe I made it. El Chaltén, the place out of my National Geographic Travelers and Discovery documentaries. Even the road to arrive to this hamlet made it to the ‘must-see attractions’ on Trip Advisor. Landscapes shimmered like pure gold in the divine sunlight, the majestic Andes opened as a giant gateway to unspoilt charm. ​I dived into some coffee-Wi-Fi-bar to inform the world (read: my mom) about my life safety, where the owner promptly donated a Ruta-40-Patagonia-patch for my already almost entirely patched and well-traveled backpack. “You deserved that one, nomad”, the good man winked. Yes, they sell patches here… and El-Chaltén-coffee-mugs, El-Chaltén-t-shirts and probably even El-Chaltén-condoms if you search long enough. In short: It’s touristy as f#ck. Every house is either a tourist agency, English-menu-restaurant or hostel. I wasn’t going to use any of those services however. I have my own intuition and sense of adventure, I can cook better cruelty-free meals than any Argentinean I know and I was staying at Leandro’s house. Leandro? Yes Leandro, one of the few Couchsurfers this community counts. 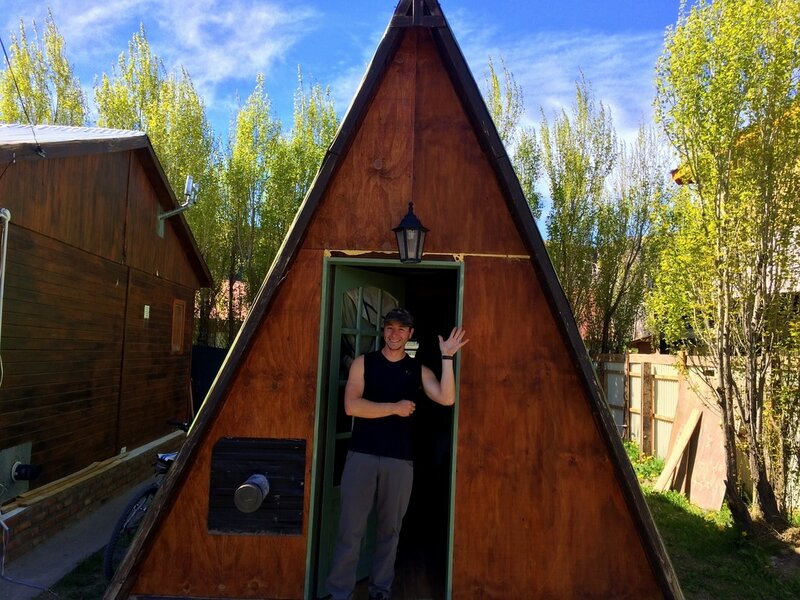 And probably living in the tiniest but cutest house I have ever slept in (except of the newspaper box at Amsterdam Central Station, but that’s another story for another time): it was basically a roof. After a full day of hitch-hiking I was longing for my sought-after bed (read: me in a sleeping bag on the floor), but I forgot I was staying with a mountain guide. When he asked if I was interested in watching the stars I didn’t entirely realize I signed up for an advanced mountain climb at midnight. However, ‘valia la pena’, it was worth the pain. The canopy of our astronomic dimension never disappoints. The night was so crystal clear and the stars twinkled so furiously you would swear they were communicating with each other. Watching the mind-blowing shooting stars traveling faster than a lifetime I listened Leandro spitting out his disdain for Chileans, the English and even their own Porteños… impossible to infiltrate my shield of equality, respect and recognition for every creature that has the right to live on this beautiful planet we’re sharing. El Chaltén was even better than I expected. ​As we came ‘home’ at 3AM and subsequently finished a bottle of wine I slept a bit (a lot) longer than necessary. However, I had still some hours left to start exploring the beginnings of Parque Nacional Los Glaciares, which is… tatataaaaa… 100% free! I followed Leandro (and the well indicated signs, you really don’t need a guide for anything here) to Laguna Capri, a place that had some stunning sights in store for every enthusiast who makes it out there. 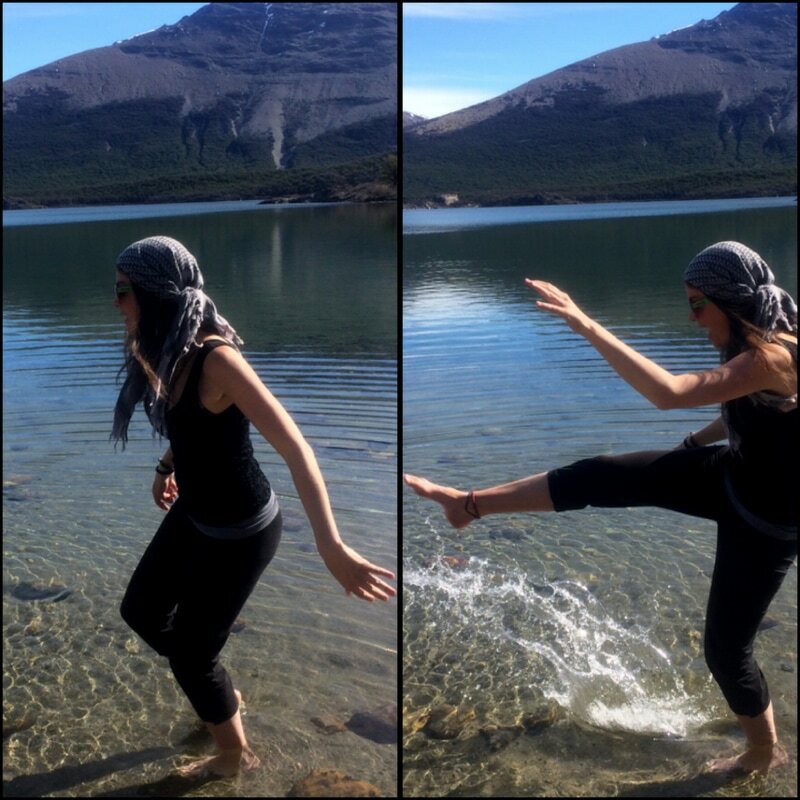 ​The clean clear water never looked more inviting, but the moment I ran in I noticed some body functions started to fail. Right, Patagonia, freezing cold… you tend to forget that in the bright shining sun tickling all your summer freckles to come out and play. The next day I decided to return to the same route, but this time finish it all the way to the eye-catcher of town: Monte Fitzroy. As I worked all morning on my writing I went a tad late however… like 2PM, which is when most people return. Well, I just pumped some up-tempo death metal in my hearing organ and elevated that speed a notch to bring a bit of darkness in the shattering heat, easy as that. Singing out loud and playing quite convincing air guitar and drums I rushed through the incomprehensible exquisiteness of the landscapes. This was something of another level, my indisputable highlight of Patagonia. ​It simply couldn’t get any better than this. And it didn’t, I crossed through the entire Patagonia for two months to come to that conclusion, however magnificent the rest is as well. ​As I could see the Fitzroy winking at me from a humble distance I assumed it would be a matter of minutes to finish the first leg of the trek. But oh hey… there was still a mountain to climb! 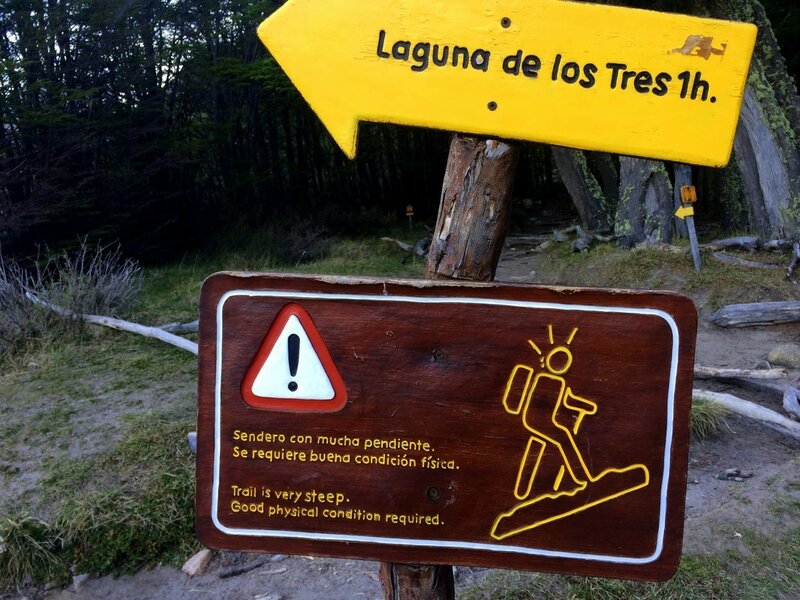 Angry signs warned all hikers about the monster we were about to ascend. VERY STEEP! GOOD PHYSICAL CONDITION REQUIRED! Ha, this vegan has an excellent condition: I bunkered some of my home-made lentil burgers and up I ran. In less than half the time indicated I reached the base, overtaking everyone. I have 99 problems but protein ain’t one. I realized I didn’t leave too late: I had arrived exactly on time. The sunset-show was about the start… the gentle face of the generous sun expressing her last smiles right in between the famous peaks that put El Chaltén on the map. The spectacular frozen Laguna de los Tres stretched out like an emerald entrance of natural marble. While I was sitting front row to take in this extravaganza a bright red fox passed by, approaching me with a curious gaze. We are sharing this Earth. ​I have no words for it (oh well, a lot actually). As I saw the shadow of the Fitzroy swallowing the valley I understood I had to commence my return. I wasn’t done with this place. Leandro recommended a waterfall called Chorillo de Salto, which I could reach by bike. His bike. While driving I realized a miniskirt and low tanktop probably wasn’t the best outfit for a mountainbike-expedition (for the record: in my country we go to the discotheque by bike in our sexiest clothes, so blame my culture), but at least my whereabouts were clearly noticed in the unlikely case I would go missing. After I conquered the troublesome dirt-stone-road and the brutal wind to reach this relatively close by destination, I concluded it was probably the least impressive point El Chaltén has to offer. ​Luckily I had some more time that day to make my way to Mirador de los Cóndores, an accessible ascend that even a (fit) three-year-old could wrap up in half an hour. The wind was rather uncomfortable, but the views over town are certainly worth a shot. ​Okay, another day then. I could go to some glaciers. I name a Humuel and a Viedma, but those tours are a scandalous 130 bucks each and I had Perito Moreno, Grey and some other snow slides lined up already. It was either going to be Sendero Loma del Pliegue or the other big one, Laguna Torre. Once I had stretched up for the online exclaimed ‘one of the world’s greatest hikes’ I ignored the rain clouds and rigidly followed the rough path to the Torre with an ever-leaking nose. The walk was enjoyable, for sure, but hardly as scenic as the Laguna de Los Tres one I did a few days before. But then I reached the lake. Without prior announcement or indication it’s there all of sudden, without anticipation. If the wind didn’t already blow you off your feet it will happen within mere seconds after your mind grasped this sight. Where else would you promptly scream out a cuck-a-doodle-doo-crow-of-rooster-sound to swiftly release all instantly accumulated energy? A celeste pond of pure divinity enriched by the exciting disruptions of virgin white ice floes. What more can a person ask for. I, nothing. 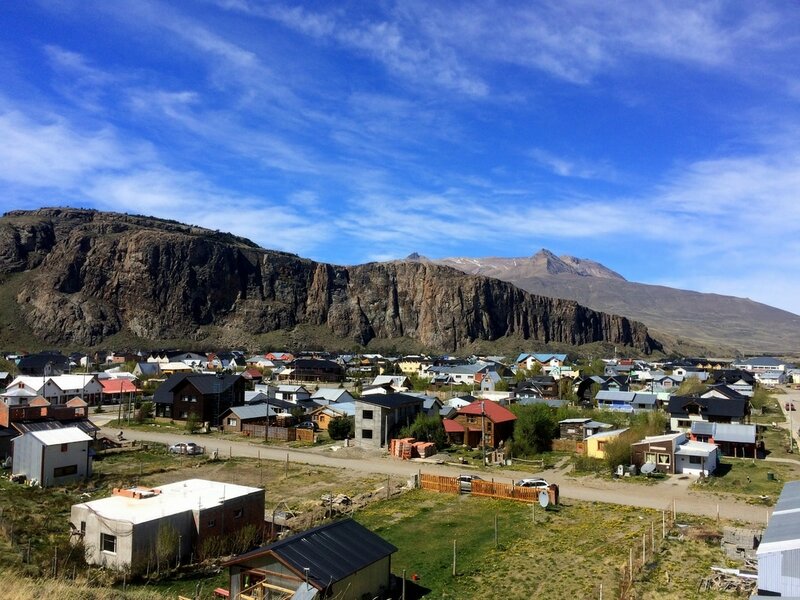 ​El Chaltén satisfied all my needs, wishes and desires. - Where to go to next? 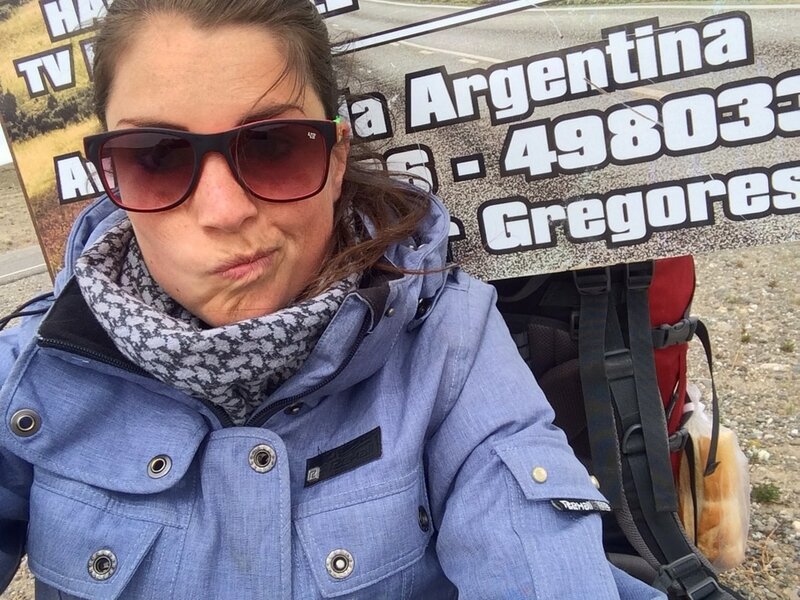 Check the Argentina Page!